Oh, cauliflower – what can’t you do? You can be roasted whole. You’re delicious in Banh Mi. You make tacos better (somehow). Seriously, I think I’m in love. This 6-ingredient, 30-minute recipe is bound to wow your guests this holiday season (and beyond). 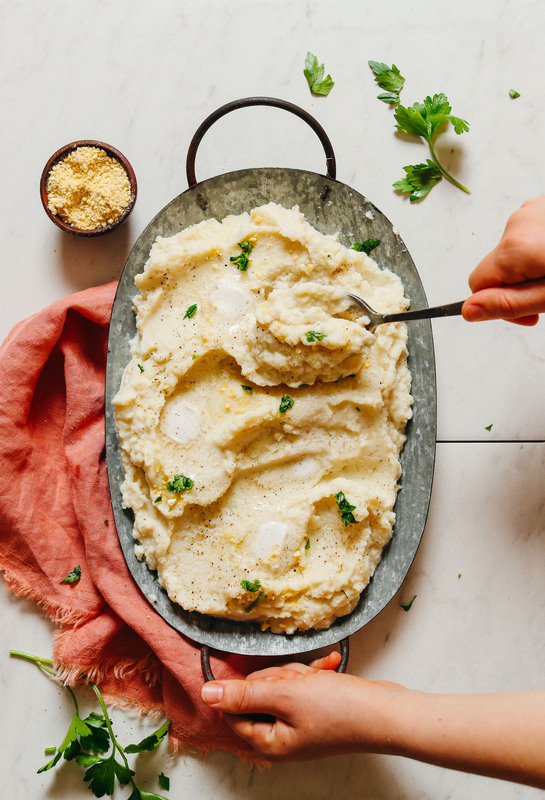 Cauliflower mocks mashed potatoes beautifully, and it all starts by steaming your cauliflower until tender. While that’s happening, sauté garlic in some vegan butter (or olive oil – see notes if avoiding oil / butter). Or, keep your garlic raw for a punchier, stronger garlic flavor! Once steamed, transfer cauliflower in batches to a food processor (or use an immersion blender) to blend until smooth. You’ll add more salt and pepper to taste, and a dash of dairy-free milk to get a velvety, creamy texture. This would make a beautiful side dish for the holidays and beyond! Top with more fresh garlic, vegan butter, and your favorite fresh herbs to really dress it up. You could even blend in a little nutritional yeast to add cheesy flavor, or vegan cream cheese for more creaminess. For more holiday side inspiration, be sure to check out our Roasted Squash Salad with Crispy Shallot and Balsamic Reduction, Easy Vegan Gluten Free Biscuits, French Style Potato Salad, or Abundance Kale Salad with Savory Tahini Dressing. 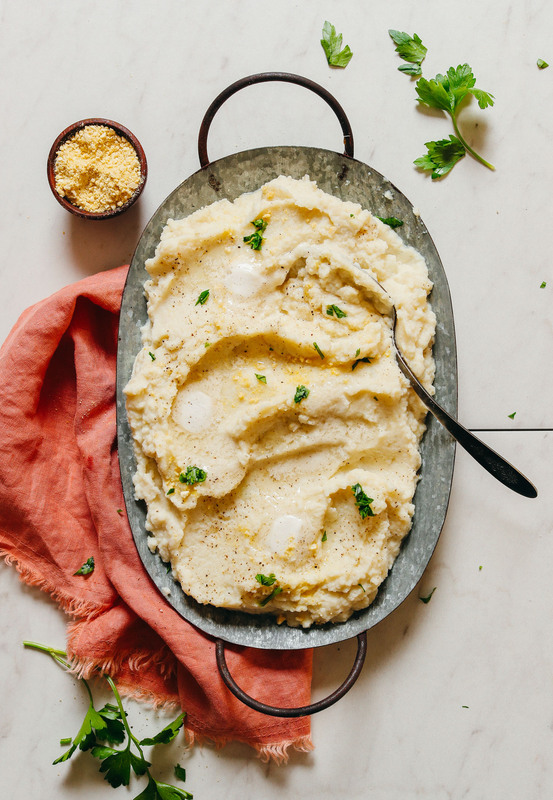 Move over mashed potatoes - there's a new side in town! 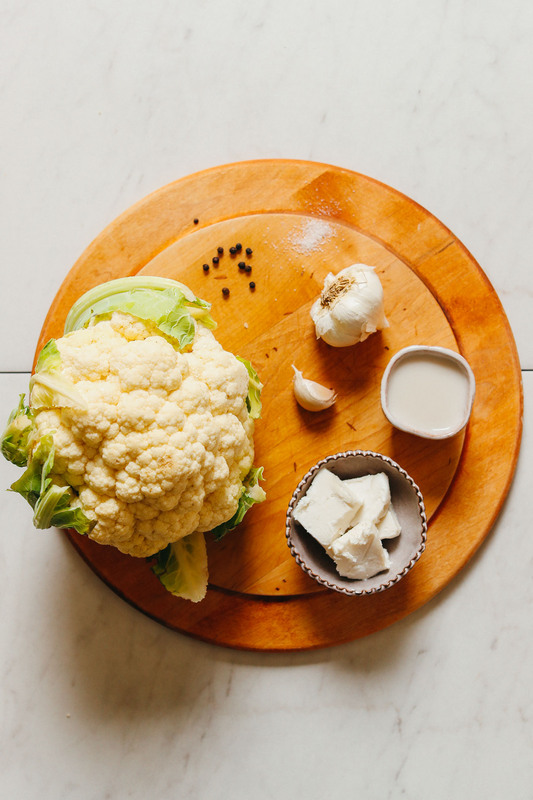 Try our 6-ingredient, 30-minute whipped cauliflower that's creamy, comforting, salty, garlicky, buttery, and SO easy to make! The perfect plant-based, gluten-free side! 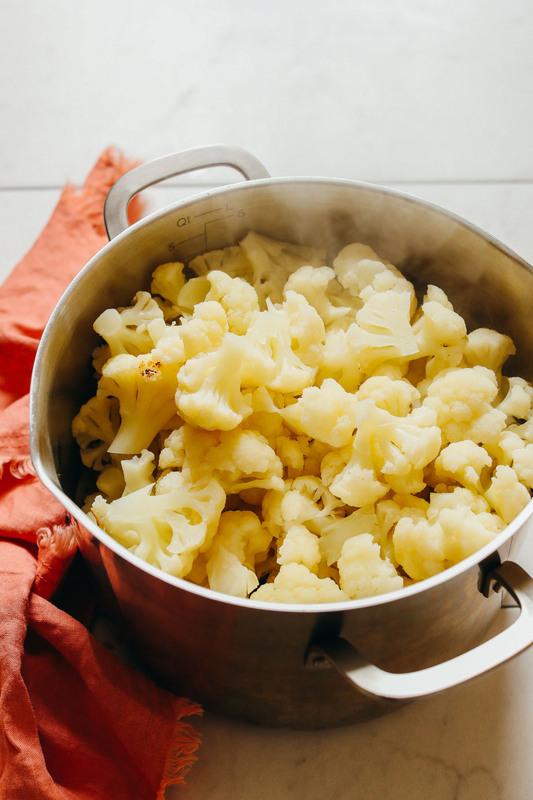 Cut cauliflower into even florets and steam in a large pot with a steamer basket (covered) until very tender - about 15-20 minutes depending on size of pot and cauliflower florets. Remove from heat and set aside uncovered to cool slightly. In the meantime, sauté the garlic in the vegan butter in a small skillet over medium-low heat for 2-3 minutes or until just slightly browned (be careful not to burn). Or, you can keep your garlic raw for a punchier, stronger garlic flavor! Turn off heat and set aside. 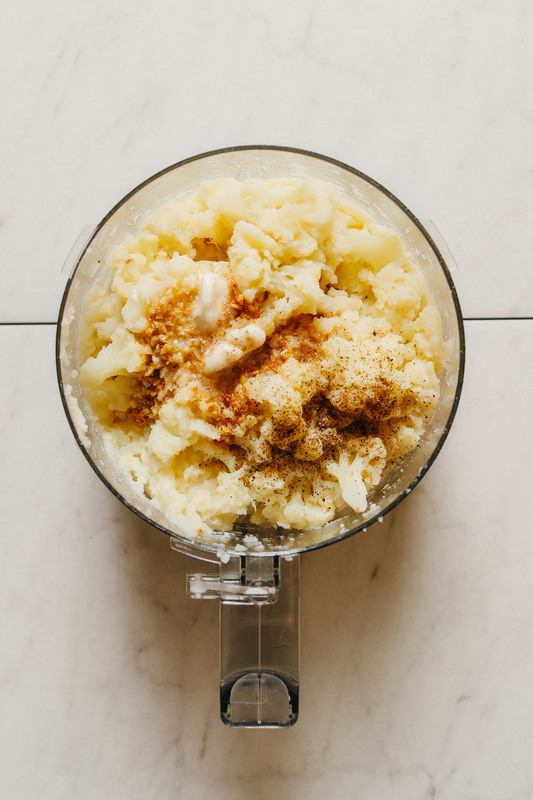 Transfer half of the cauliflower to a food processor (or use an immersion blender to purée cauliflower in a pot or saucepan) and process until puréed. (The amount of cauliflower you’re able to purée at once will vary based on the size of your food processor). Then add half of the garlic butter as well as half of the salt and pepper and process until well combined. 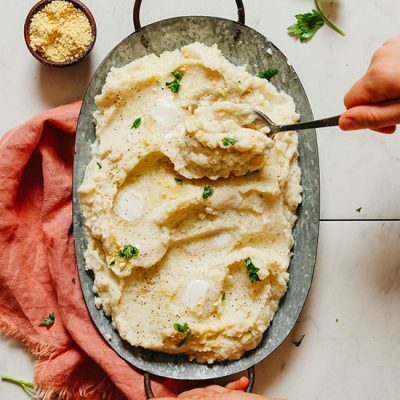 Taste and adjust flavor as needed, adding more salt and pepper to taste, garlic for intense garlic flavor, vegan butter for buttery flavor, or almond milk to help the cauliflower purée. Note: You could even blend in a little nutritional yeast to add cheesy flavor, or vegan cream cheese for more creaminess (optional). Transfer to a mixing bowl or serving platter and cover to keep warm. Then repeat this blending and seasoning process until all the cauliflower is whipped and seasoned. Garnish with herbs and vegan parmesan cheese (optional), and another sprinkle of salt and pepper and serve hot. Store leftovers covered in the refrigerator up to 3-4 days, or 1 month in the freezer. Reheat in the microwave or on the stovetop in a saucepan until hot. *If avoiding oil / butter, sub roasted garlic in place of sautéed, omit oil / butter, and add more almond milk in step 4 as needed. *Nutrition information is a rough estimate calculated with lesser amount of garlic and almond milk and without optional ingredients. *Recipe (as written) yields ~4 1/2 cups. This is fantastic! I served it with the Mushroom Lentil Stew. Hmm good question. We haven’t tried and can’t say for sure, but if you experiment with the recipe, report back on how it goes! Fantastic recipe, have made it twice in the last two weeks. Followed it exactly but used a vitamix, which yielded more of a whipped texture that is lovely. Thank you thank you for this great recipe! We’re so glad you enjoyed this recipe, Aneesha! Hi. Thank you so much for this recipe. When I made this last night, it was delicious! But it was more liquidy like a Cauliflower Soup?? I followed the directions (including putting cooked cauliflower on a towel to dry before processing it. The only difference I can see is that I used a Vitamix (not a Cuisanart food processor) to chop cauliflower add all ingredients too?? Could that be why it turned out more like soup? Oh by the way I didn t like the idea of wrapping the garlic in aluminum foil. Instead, I prepared the garlic just like you said, but placed garlic on a steel cookie sheet with an oven safe glass bowl over it put in oven for 45-60 minutes. DELICIOUS! Yes, that was likely the reason your cauliflower resulted in a different texture, James. For better success, I’d recommend using a food processor! Hi! This looks amazing, but my daughter has to cut down on potassium, and I’m wondering if there’s one ingredient I could cut out and still make this? I have a feeling it might be the cauliflower, but not sure. Maybe the vegan butter?? I so want to make this for her! Thanks in advance. I used homemade oatmilk instead of almond, and 2 cloves of oven-roasted garlic. We enjoyed this alongside roasted butternut squash and braised kale. Great comfort food! Great! Thanks for sharing, Sarah! Just made this and served with a batch of your coconut curried lentils…not sure which recipe I liked more! Both so cozy, filling, and delicious 🤤 tasted amazing together! Can I use garlic paste instead of sauteed or roasted garlic? Yes, that should work though we haven’t tried it ourselves! These were SO delicious! Used plain soy milk bc I was out of plain almond. Will use a ton of garlic next time. LOVE!!! Made these tonight and they were delicious! I’m hooked and making them part of my winter dinners on the regular. Thanks for sharing! Lovely! Thanks for sharing, Raquel. This looks delicious. Do you think it would work with frozen cauliflower? What a lovely twist on a classic favourite! Lovely idea! Thanks for sharing, Dena. I love all of your amazing recipes. Such a fan! I am wondering if you would be willing to consider some slow cooker meals??? Several days a week, I am busy running to hockey practice, etc…and it would be great to have some dinner cooking at the end of a busy day. Thanks for considering it! Thanks for the suggestion, Jamie! I’d love slow cooker recipes too! 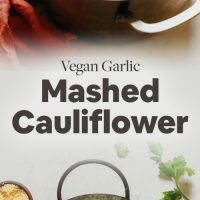 Wow, I have never thought of mashing cauliflower – that is so genius and with the hint of garlic I can’t wait to try this recipe out. Yum!